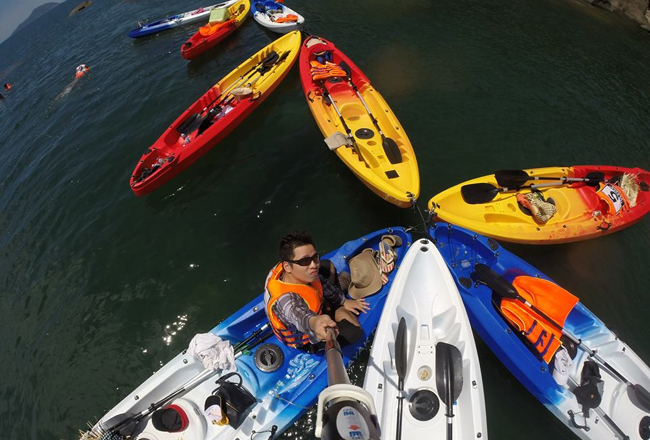 On the coast of Da Nang's Son Tra Peninsula, Nguyen Kim Thu, 32, and a 20-member yoga team like to explore the sea on kayak, an increasingly popular tourist activity. But the adventurers are more than just people who like to use some muscle to skim the waves, they also practise yoga moves on their flimsy vessels. 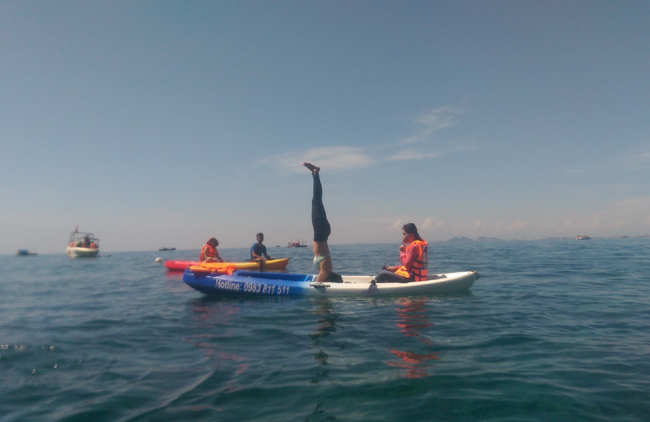 Thu, who teaches yoga in Da Nang, finds the meditative exercises on a kayak are as tough as they sound. The sun, the wind, lapping water and fresh, salty air add a world of difference to the ancient art. "It's amazing," said Thu. "It took me a long time to be able to balance in strange positions on the floor, but we now manage to do it while rocking on a kayak and in the face of strong winds. "It's very difficult for us when we do headstands. Some of us tumble into the water during particularly difficult exercises," Thu said. 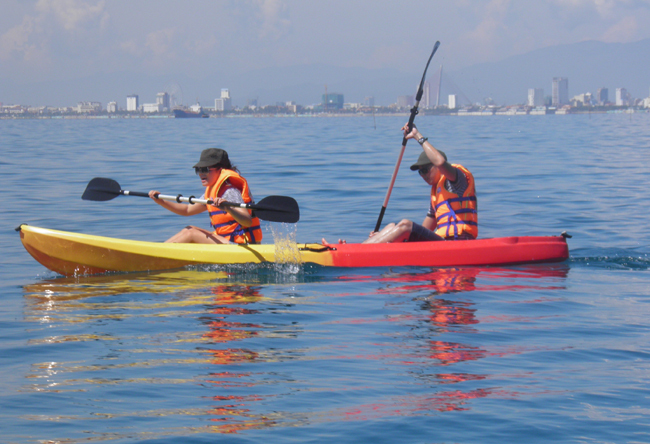 Kayak tours are a recent introduction to Da Nang's booming tourist industry. They offer visitors a more hands-on interaction with the city and its surroundings. The tours can be easily customised. Thu and her team kayak to Bai Nom rock, a protected coral reef which is home to schools of fish, shell-fish and snails. They stop along the way as fancy dictates and share a seaside lunch. "We can stop and rest wherever, on the beach, on a rock, in the canoe, or under the shadow of a tree. There are plenty of romantic places to sit and admire the beach, the mountains and jungles," Thu said. Smooth sailor: Beginners get a 15-minute demonstration and instructions before setting off. Another member of the group, Nguyen Thi Sau, 25, enjoys swimming in the sea to ease her stressed muscles. "When I get tired from kayaking, swimming and diving, the sea relaxes my muscles," Sau said. Yoga and saltwater kayaking are a surprisingly good match. Kayaking is an adventure in every sense of the word. Nguyen Ba Hung, who works as a life-saver for the tours, said participants were educated about environmental protection and taught survival skills. "We educate tourists about the harmful effects of leaving rubbish at tourist sites, damaging coral reefs and over-fishing," he said. Rocks, jetties and coral reefs off the coast of Son Tra are the most popular destinations. Tourists can often join in the cooking or fish for snails and squid with fishermen on the beach. Alternatively, kayakers may choose to explore the jungles and beaches at the foot of the Hai Van Pass. Fun in the sun: Tourists enjoy kayaking in the sea and river. Or perhaps visit the site of Van village, which was destroyed to make way for a resort project at the foot of the Hai Van Pass. Only fruit gardens and jungles remain to remind visitors of its not-so-distant past. Most of the routes leave from a wharf on Nguyen Tat Thanh street. They generally take 30 minutes of kayaking each way, but this can be a big challenge even to the fit adventurers. Le Hoang Minh, an engineer, said his trip was quite smooth in the first few minutes, but then his group had to battle big waves. "Coaching from lifesavers eased our difficulties," he said. "Since the kayaks we use are designed for two, tourists need to be taught to paddle smoothly. It only takes a little instruction to learn to get the technique right," lifesaver Hung said. Minh said his efforts were worth it. After landing on a tranquil beach, his group harvested fruit from the garden belonging to the old village. For Minh, it was a "feeling of being in nature, harvesting the wilds of the forest". Khoa, the tour operator said a support canoe often accompanied newcomers in case of trouble. Kayaks are also increasingly popular along Da Nang's Han River. Tourists can be seen enjoying a short and easy paddle between bridges. The more visible patrons are newlyweds with cameramen capturing every moment. "We chose the section between the Rong (Dragon) and Tran Thi Ly bridge for a photo tour because the colourful lights from the two bridges are so beautiful," Khoa said.